Property Size 1,839 sq. ft. 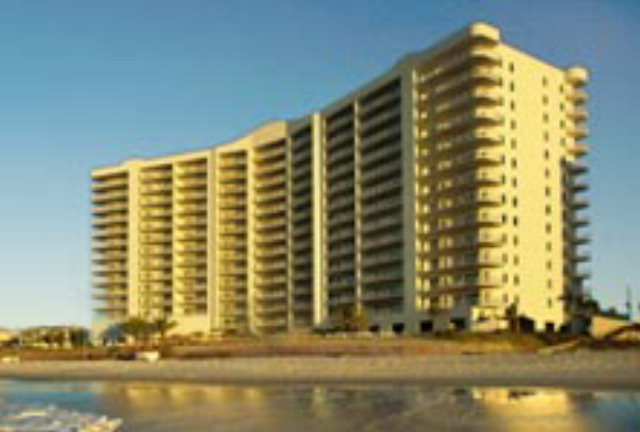 Experience luxury in paradise,in the most accommodating resort complex in Orange Beach. Park your vehicle in the reserved covered parking space, and enjoy a full complement of amenities awaits you, including a large indoor pool, fully equipped fitness center, sauna, and Gulf front outdoor pool and deck area. From the moment you enter this luxurious eighth floor unit, you will appreciate the tasteful decor and attention to details. It is by no means your average, ordinary condo! This beautiful three bedroom, three bath condominium features high end furnishings and uniquely decorative accessories throughout. Every room affords spectacular views and uncompromising comfort. The living, dining and kitchen area is completely open and offers unobstructed views of the Gulf of Mexico. From the plush furnishings, full size sofas in living room plus two occasional chairs and a recliner, the 52 inch LCD television and DVD player, the elegant dining table that seats six, to the large granite kitchen island, breakfast bar, and convenient mirrored wet bar with its own ice maker, the whole area invites you to relax and enjoy its comfort and spaciousness. The kitchen is fully equipped and features state-of-the-art appliances, including a side-by-side refrigerator with ice and water on the door, fully electronic range, microwave, dishwasher, and full size washer and dryer. There is also a portable phone with answering machine for guest's convenience. The master bedroom suite also opens to the large Gulf front balcony. The furniture is elegant, including a king-size,bed, two night tables with lamps, a telephone, a clock/radio and a 32' LCD/DVD TV. The master bath features a huge walk-in closet and double vanity area, and an over-sized, club shaped jetted tub and glass enclosed shower. Just bring along your favorite relaxing CD, aromatherapy candles, and bath potions and submerse yourself in your own private spa! The second bedroom with its own full sized bath with separate dressing area, has two double beds and may evoke the feeling of a tropical oasis. This guest room has their own 32 inch stereo TV and DVD, telephone and clock radio. The third bedroom offers a peaceful aura. It features a queen-size bed, 32' LCD/DVD TV, telephone, clock radio and private entrance to the third bath. Each of these bedrooms offer their own beautiful scenic views of Cotton Bayou and Perdido Pass. The view from the enormous Gulf front balcony is spectacular in every direction. Allow yourself to take in the fresh Gulf air and immerse you spirit into the spectrum of aqua and emerald water that stretches as far as the eye can see. 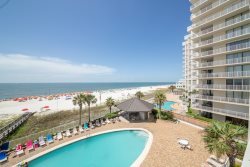 With Perdido Pass to the east, and Romar Beach to the west, you can enjoy outside dining or just lounging around on the comfortable outdoor furnishings. This exquisite condominium is available for weekly rentals only (Saturday - Saturday only) throughout the year, and monthly rentals in the Fall and Winter. Everyone was friendly, nice, & helpful. It was a great stay. The place was clean and well maintained. The view from our balcony was beautiful..